Andi Benge creates a full-room immersive installation piece that includes contemporary paintings, sculptures, and performance. 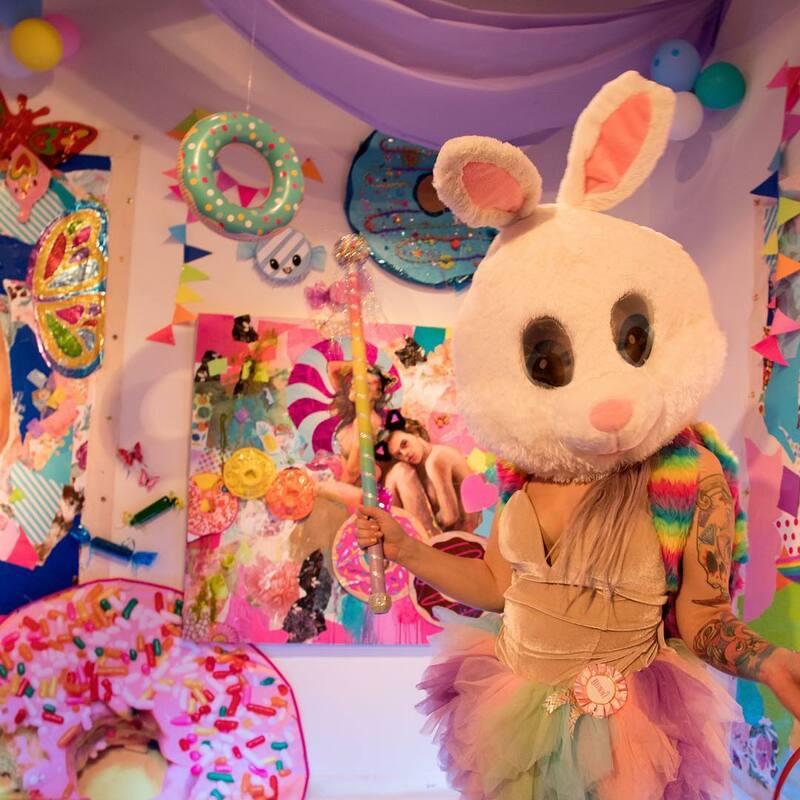 The installation piece includes a performance by her alter ego character, Bunni, who passes out candy from a broken piñata to visitors during Saturday afternoon receptions. Working in several media, Andi uses a variety of campy materials to create a whimsical plastic wonderland of immersive installations. Her alter ego, Bunni, invites viewers into a dreamworld otherwise known as Andiland. Here, vulnerable female nudes are surrounded by playful objects and bright colors drawn from a tumultuous adolescence. Beyond the sweet surface lies a critical attempt to confront the taboos surrounding female sexuality and celebrate it’s dangerous archetypal allure. Andi is the first artist in the new Mason Art Project Space, a series of collaborations with George Mason School of Art’s MFA program located in Studio 8. Through faculty-led discussions and assignments, the program encourage students to explore and experiment with topics that emphasize new technologies, increased sustainability efforts, improved accessibility to marginalized members of societies, and other socially relevant topics.